So somehow my invitation to the royal wedding was lost in the mail. I am not sure how this happened, but I am sure it will arrive any minute now. So in the case it shows up, I wanted to be prepared with something fab to wear. I did a little research to see what one wears to such an event and found that long is almost mandatory, you must have on a curtsy appropriate dress for when you address the Queen, and you better bring it. The crowd will be posh, sophisticated, and classy. Slits up the thigh, cleavage, or back bearing dresses would be frowned upon, so leave the BeBe at home. 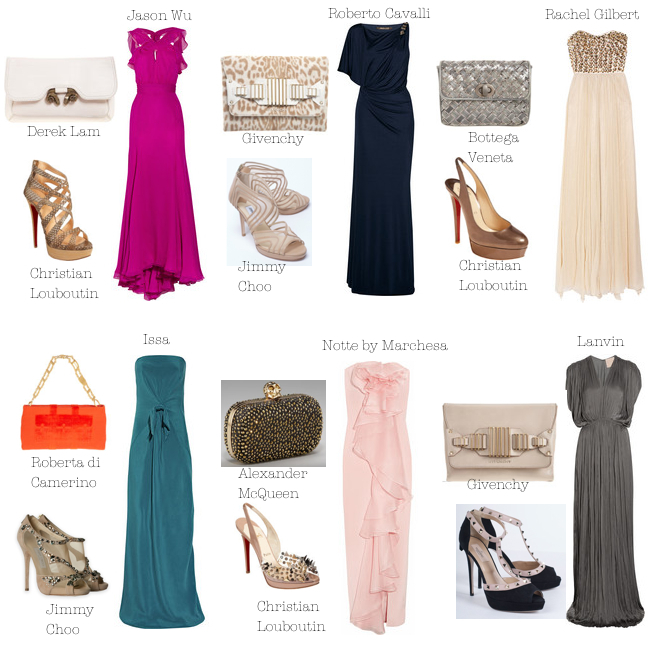 The looks I put together are all very different, but I would sport any of them come this weekend. All of the dresses have some drape and an ease to them. The last thing you want to be doing in the presence of royalty is look like you are trying too hard. And because this is a wedding I wanted to make sure they all had a bit of romance to them, but a touch of edge in the accessories to chic it up a bit. I included one of Kate's favorite designers, Issa, as I know that wearing it will make us fast friends. We will strike up a conversation about our love for comfortable, figure friendly fashion, and before I know it she will be inviting me to Anglesey for a weekend in the country with her and Wills. Well, at least that is how I imagine it. Until that happens, I will be setting my alarm to watch with the rest of the world. Which of these looks would you be wearing?